I do like going into the office. It’s good to see people, chat, find out what’s happening in other departments. I really enjoy the drive to the office these days. After decades of commutes on rush-hour packed roads, I now have a commute of 6.7 miles (yes, I measured). It goes through the outskirts of an ecological preserve, past a farm where there are horses grazing in the field, past a lovely little lake and even has the convenience of my bank and favorite grocery store before I reach the office. On the way home I have a great view of the river as well (only in the winter – in other seasons the trees in the park along the river block that view). I also love having the flexibility to work from home. That’s so helpful if there are contractors coming, or if I need to run errands that are closer to home than the office, or if the weather is terrible and I don’t feel like driving even that short distance. That flexibility combined with the short commute also means that should I start sneezing and blowing my nose non-stop, I can pack up my stuff and leave the office and head back home. That was Monday. I was all set to enjoy the last week at the office for this year. I bought coffee supplies and donuts for the coffee room. I made myself my coffee sat down at my desk and….. the sneezing started. And never stopped. I used up all my tissues. Note to self: remember to bring in new box. After 45 minutes of this I decided that NO one needed or wanted me to stay in the office. We even get lovely emails from HR reminding us to keep away if we are ill. I shut down the machines, packed up and went home (12 minutes door to door. yes, I’m gloating). I drank copious amounts of hot tea, had tissues right to hand, even made the training session I had to lead without sneezing into the microphone. Tomato. It’s Wednesday and I’m still home, because I thought oh why bother packing up and going in, so many people were planning to take off this week anyway. There weren’t many folk in the office on Monday and I’m sure there will be fewer today. I’m still home. OMG, I’m still HOME. I am going stir-crazy. I know that there are people who like to ‘nest’, burrow in as it were and do…. heck, I don’t know what they do. It’s been over 50 hours straight and I am soooooo tired of this view!!!! I neeeeeeed to get out. The sun is shining. I’m not sick. The cats are terrible conversationalists. Every where I look I see ‘things that need doing’. I want my office. I want OUT. Tomahto. Anyone interested in meeting for a cup of coffee?????? I found myself with some time on my hands today. And new holiday decorations from friends. As I have run out of prims at my home, 😦 , I decided to decorate my office. Yes, I do still have my office and I even go and hang out there occasionally. Oura made the beautiful poinsettia tree and Honour made (and is selling) the wreaths at Aintree Gardens. I think maybe I need to throw an office party. Oh – first I need to find lamps with lampshades. THEN the room will be ready for a party. Honour is beginning to change the way I think. 🙂 Yesterday I was told that my make-shift office was “too big”. Yeah, I felt a little squashed. I was quite proud that I whipped it together so quickly out of mostly nothing. I was hoping for an “atta girl” before the “But….”. Life is what life is, deal with it, Ahuva. I mentioned this to Honour. She said “So build a wall.” LOL. Well, right. 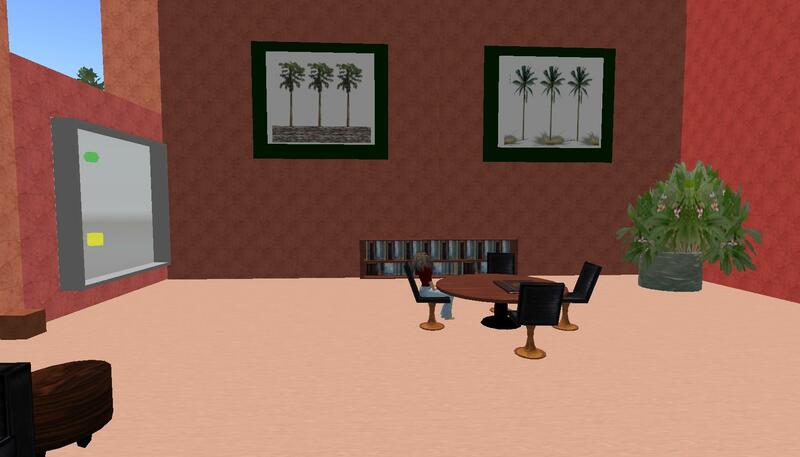 It’s easy to change reality in SL. First I moved all the office furniture into a smaller vacant shop. It was still too big. So I began to build walls. 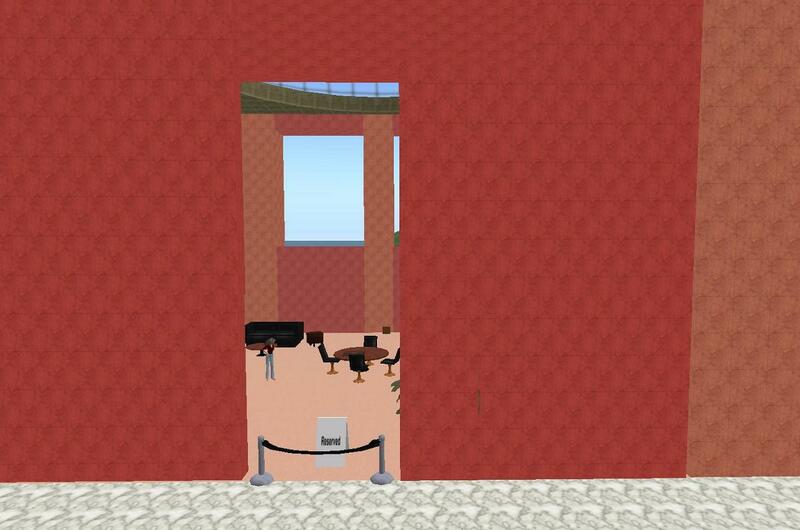 I put a wall up to block out the mall and I created an inner wall to reduce the width of the room. I can always move those mall walls in closer as well to shrink the length of the room. The problem with the walls is the color. For some reason I can’t edit the existing walls and see their textures. I SHOULD, since I own this sim. I will contact my favorite general contractor today, however, and ask for his assistance in getting the colors right. I looked at the bare walls. I figured an office needed art. I was sooooo tired last night (I am working 24/7 – yes – I am DREAMING about this project. I mean it – working 24/7). 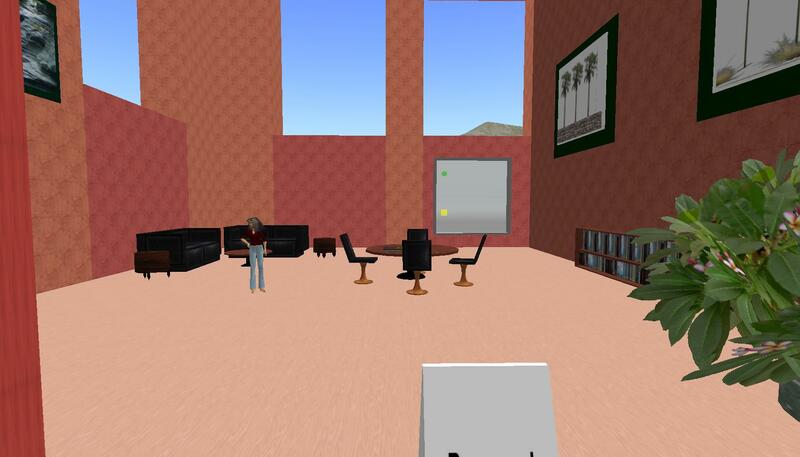 All I could think of for art was to use existing textures in OpenSim. I knew that there were some trees. 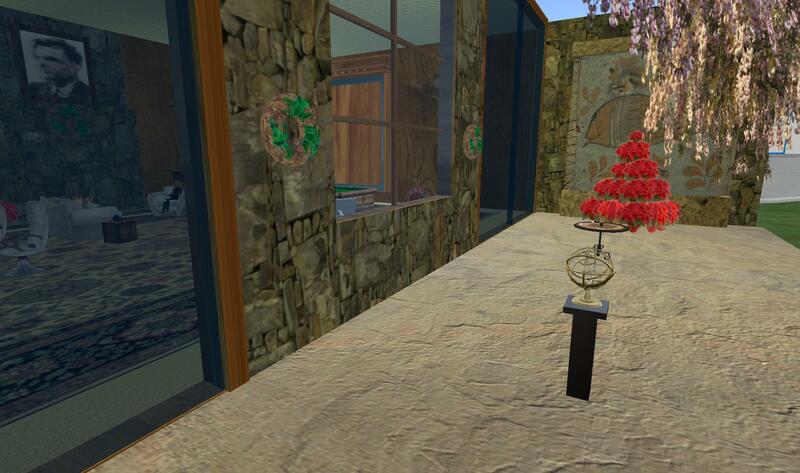 I made picture frames, and then put up 2 prims with alpha textures. Trees and grass!!! Trees and a wall!!! C’mon – don’t they look like modern office art??? The wall still looked bare so I made a bookcase. It was empty, but I thought it showed intent. My last thought for the evening was to get some greenery into the office (hey – I started this virtual life as a gardener, remember????). So I made a cylinder, textured it with marble and plopped in a handy-dandy bush from outside the mall. And I went to sleep, thinking about how I could put something in the bookcase. I woke up this morning and took pictures of my husband’s book shelf. 🙂 See!! 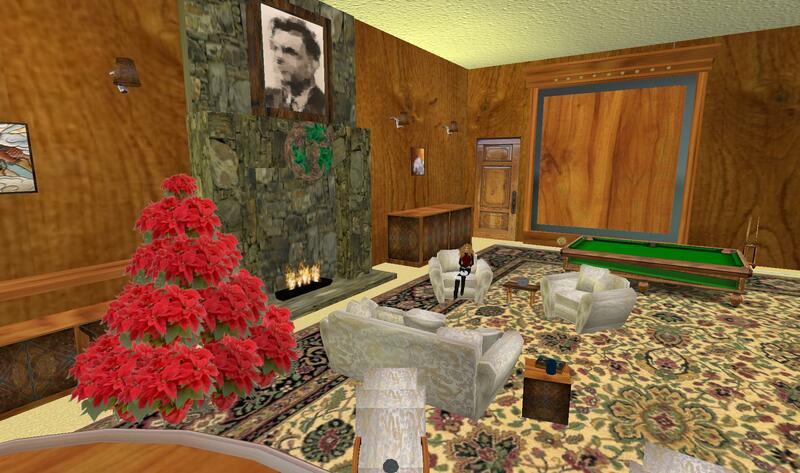 All of you who always ask what he thinks of my living in SL – he is VERY supportive of my work. I figured I could turn those pictures into a texture, shove them on a prim and shove that prim in the bookcase. I used repeats and offsets to differentiate the 2 shelves a little bit. They are still too similar, but not bad for 5:30 am. Presto! Books! Driving in to work I knew that I needed art on the other wall as well. I started thinking about what textures I had that were my own. It dawned on me that a texture is merely a picture. I have all my vacation photos for the last several years on my computer. *grin* Niagara Falls? The Grand Canyon? Watkins Glen Gorge won out this morning. Click, click, click – picture frames and pictures. I put another planter and flower in the other corner of the room. So what do you think??? I need to fix the wall colors, maybe move the walls in a bit more. I probably need more art on the wall. Maybe a lamp or a vase or something. But I MADE these things!!!! I’m sitting here thinking about ways to make a vase, ways to make some flowers (alpha textures), ways to build some coffee mugs. I don’t think I’m quite ready to make a phone, but who knows – maybe I’ll be inspired this weekend.